The subject of this case study is a global recycling company. This company specializes in a number of different recycling processes, many of which are proprietary, to reprocess a variety of industrial materials. An end user, with a proprietary way of separating specific desired materials from micro chips, reached out to the recycling company. The end user enlisted the help of the recycler in developing a faster and more efficient way to process microchips. The end user had been using a German grinder to size the microchips to a size capable of maximizing the salvageable material but had limited success. The current process being used was only operational at slow and low capacity. Another challenge in developing a new process, was to find a way to process the microchips without increasing their temperature. At higher temperatures, the metals within the microchips fuse, creating further problems in the end user’s proprietary process of recovering materials. Searching for a company with decades of particle sizing expertise, the recycling company reached out to Prater Industries. After meeting with a Regional Sales Manager for Prater, Tony Lopez, it was suggested that the recycler send samples to Prater’s Bolingbrook location for evaluation and laboratory testing. After a series of batch tests, the desired sizing outcome was achieved using Prater’s G6 Full Screen Hammermill. The G6 Full Screen Hammermill’s efficient design utilizes 100% of the screen area increasing throughput capacity without increased power requirements. Wider rotors accommodate a variety of hammer arrangement for specific sizing needs. Uniform granular grind, even hammer wear and 24 hour/day operation made the G6 the perfect fit for the Microchip application. Both parties were extremely pleased that Prater lab tests were able to reduce large batches of microchips, approximately 500 lbs per hour, to a desirable size for their process. Confidence in the Prater G6 effectiveness allowed the recycler and the end user to develop a regional strategy to expand their microchip collection and expansion. Tony Lopez is the Northeast Regional Sales Manager for Prater. Tony has worked for the company since 2006. His technical discipline comes from over 25 years of processing and manufacturing in various managerial roles. At Prater, results come first. 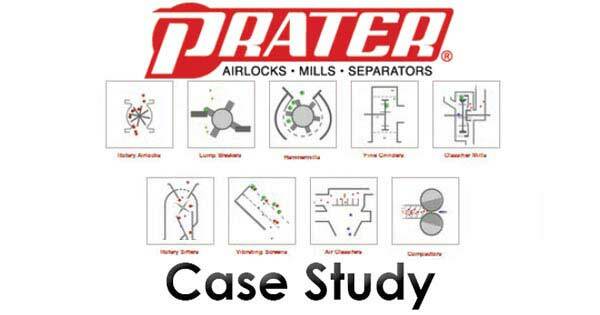 Prater has been providing reliable particle management solutions since 1925. The company specializes in an extensive line of equipment and engineered systems including rotary airlocks, lump breakers, hammermills, fine grinders, classifier mills, screeners/separators, air classifiers, compactors, plant-wide automation/controls as well as toll processing services.